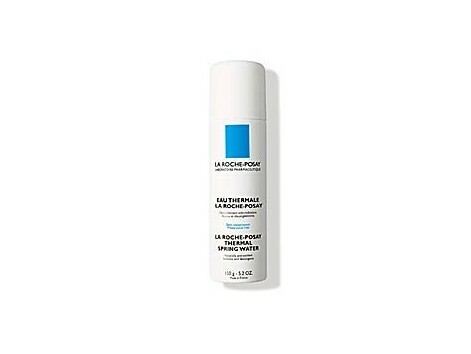 La Roche Posay Thermal Spring Water 150 ml. The thermal water is a basic beauty offers other possibilities, thanks to its healing soothing properties, and desensitizing. Such sprays contain natural thermal water, no preservative, fragrance and bacteriologically pure, qualities that make it an excellent cosmetic treatment. It can be used as many times as necessary to energize skin morning and activate blood circulation to cool the skin during the day to soothe irritations, as adjunctive therapy after irritating dermatological protocols, after waxing ... analyze your applications. HOW TO USE Vaporízala on your face and leave on for a few seconds. Then dry gently tapping with a small cotton ball or a tissue. MORE LIKE WHAT is especially suitable for sensitive skins. If you have extremely sensitive skin that suffers every time you wash it, I recommend that you clarify with thermal water, replacing the water stream. A FIXER UP is one of his lesser-known uses but no less efficient. You can set your makeup gently steaming thermal water? Seeks to distance the spray is sprayed only with a soft haze, and letting it dry.